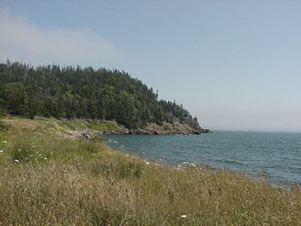 Mink Cove is a small fishing community located between Sandy Cove and Little River on the St.Mary's Bay. Mink Cove was once called Mint Cove because there was so much wild mint growing along the shore. It was changed to Mink Cove due to a post office stamp error that was never changed. When you visit Mink Cove you can walk along the shore, collecting rocks and driftwood. On a clear day you can see the French Shore and watch the boats go by. In 1604, Samuel de Champlain landed in Mink Cove as he was scouting places for settlement and mapping the area. He said: "In this place there is a very good silver mine, according to the report of the miner, Master Simon, who was with me." He landed here before making his way to Port Royal where settlers built the Habitation. The main business in Mink Cove is a small fish processing plant just before you get to the beach.